One of the few pieces I displayed in the Dia De Los Muertos art show at the Tioga Sequoia Brewery beer garden in Downtown Fresno. Had a great time hanging out with old friends and new. 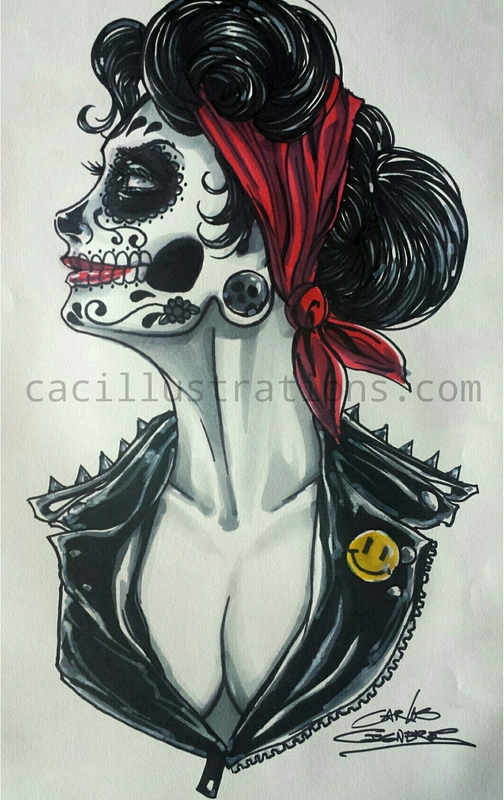 This entry was posted in Uncategorized and tagged art, art show, arte, cacillustrations, carlos cisneros, comic art, day of the dead, dia de los muertos, downtown fresno, drawing, fresno, Fresno art, ink, leather jacket, lowbrow art, markers, pen, sharpie, sketch, street art, tioga sequoia, woman. Bookmark the permalink. Love this! Beautiful mash-up of cultures and periods. Reblogged this on A Writer's Ramblings .